You are here: Home / General / Nebosh in patna with combo offer from Green World Group!! 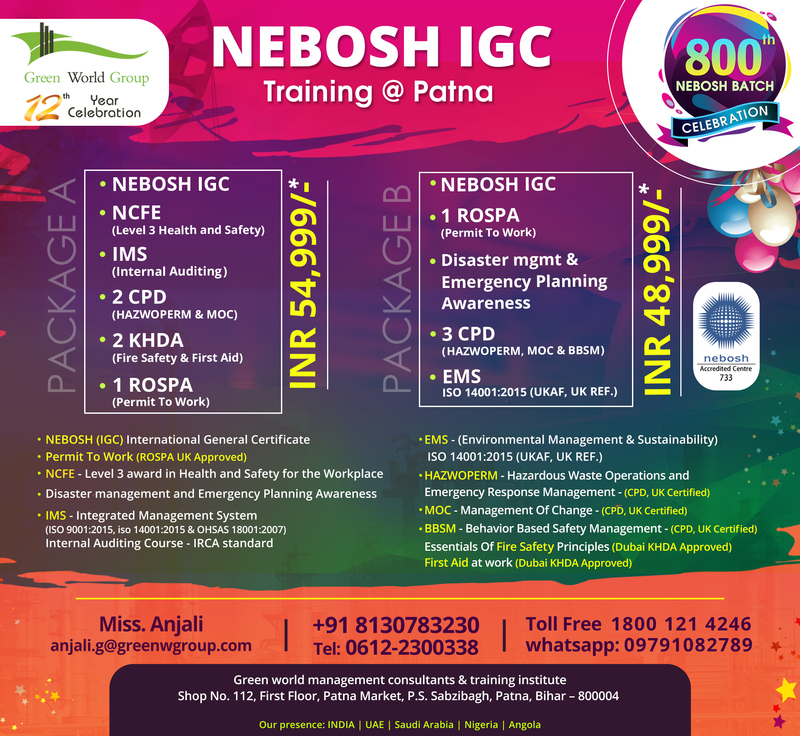 Nebosh in patna with combo offer from Green World Group!! Excellent course training from Green World Group!! At lowest cost affordable to candidate when compared with other providers in India! GET FREE TRAINING UNTIL YOU PASS THE EXAM ! The NEBOSH International General Certificate in Occupational Safety & Health is for personnel with health & safety responsibilities e.g. managers, supervisors, safety officers & who need a grounding & recognized qualification in occupational safety & health. It is also beneficial for those wanting to further their career in the HSE field or those who wish to enhance their HSE knowledge. The NEBOSH International General Certificate in Occupational Safety and Health is a globally recognized health and safety qualification from an established independent examination board with over 25 years experience in providing up to date and relevant examinations. What are the benefits for the organization? The NEBOSH International General Certificate will benefit multinational organizations working to international standards who are seeking to implement good health and safety management across all areas of their operations. Ensuring that line managers have a sound understanding of the principles of managing risk is a key building block of an effective safety culture. Health and Safety Foundations, Setting Policy for Health and Safety, Organizing for Health and Safety, Promoting a Positive Health and Safety Culture, Risk Assessment, Principles of Control, Recording and Reporting of Events, Accident Investigation, Monitoring, Review and Audit, Movement of People and Vehicles Hazards and Control, Manual and Mechanical Handling Hazards and Control, Work Equipment Hazards and Control, Electrical Hazards and Control, Fire Hazards and Control, Chemical and Biological Health Hazards and Control, Physical and Psychological Health Hazards and Control, Construction Activities Hazards and Control. i m intrusted to do this cours plse send details. NEBOSH course coordinator will contact you with full details. Nebosh IGC course coordinator will contact you with full details. u tell me about the detail of course and about fee structure(very importent). I want to do NEBOSH course in distant learning mode.tell me abt procedure & Fees.09835337550. I am interested to attend NEBOSH Course please send the details and scheduled in Delhi and Patna. 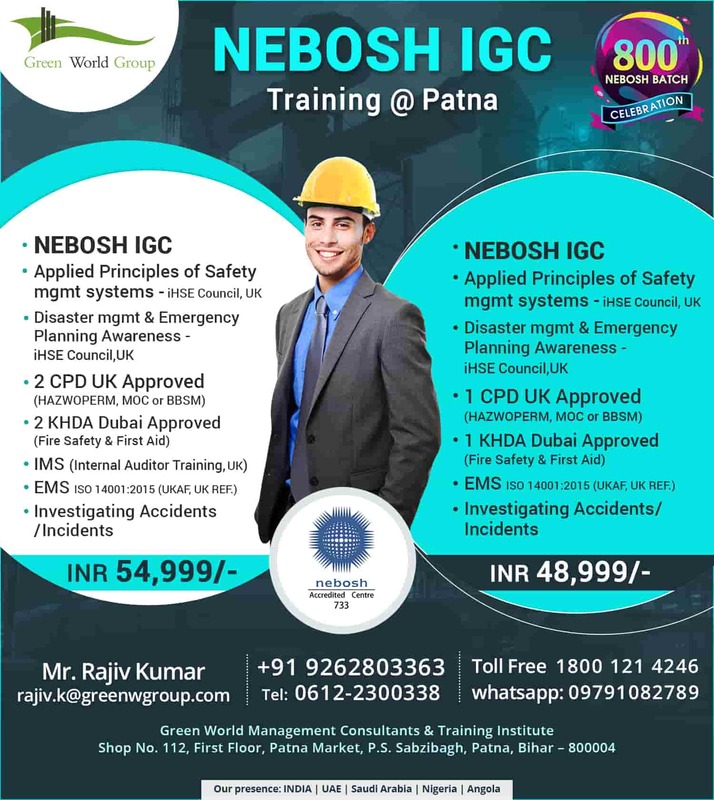 sir, i m interested to attend NEBOSH-IGC course. ple send the details in patna. Is the courses of NEBOSH IS CONDUCTING AT PATNA, GIVE ME THE DETAILS AND ADDRESS AT PATNA, BIHAR, INDIA. Nebosh IGC in course coordinator will contact you with full details. sir i would like to join this november batch can u send me the full details like fee structure…. Well, I’d love to do the course, plz send me details. I want to do Course NEBOSH. Please send me fee structure & eligibility details. will it be beneficial for me or will it help me to establish my career in safety engineering ??? Thank you for your query! One of our training coordinators from GWG will revert to you at the earliest or alternatively you could reach us at 04368220046.
will it be beneficial for me or will it help me to establish my career in safety engineering ?? Thank you for your interest in NEBOSH!!! Our course expert from GWG will revert on this shortly. Thank you for your interest in NEBOSH IOGC!!! Our course expert from GWG will revert on this shortly. Nebosh Course in Patna Contact Person and his phone number please send me urgent. Appreciate your interest in NEBOSH!!! Our Course Coordinator will revert on this shortly. hi I am from patna and right now I am working in a pharma (mnc) company sience 2010. I did my MBA from pune and I want to do NIBOSH from patna itself. kindly tell me what type of courses you offered along with fee structure and the shedule. our marketing executive will contact you soon..
Hi, I am intrested to do NEBOSH IGC course.so please send me the schedule and fee structure of the course. Thanks for your enquiry. Our Marketing executive will contact you soon.. Thanks for your enquiry.. Our Marketing executive will contact you soon..
Hi sir plz describe me about the safty course. Thanks for the enquiry. Our Marketing executive will contact you regarding this. I want to know about safety engineer. I am Gulshan Kumar from Bihar & I want to do the nebosh from my location Patna, so Please guide me, about how much the fee structure of nebosh igc, nebosh oil & gas & nebosh health & safety in minimum fee structure & also about these types of course. Thanks for the enquiry. Our product specialist will contact you soon.